Solar Newtonian 8" - Page 2 - SolarChat! What exposure and gain setting were you using before and now? In SharpCap 2.6, Exposure before was -8 and, now -9. Gain was mid-high 300's and now, low 300's. Use zero gain, or, whatever the absolute minimum is. Have you tried firecapture? Personally I find it much better user experience than sharp cap. Although the Gain setting I referred to in SharpCap 2.6 above is misleading at 300, the lowest it goes is 260. The range is 260 - 1023. Not sure why but, that includes the UVC Video controls as well. So, I'm not using much Gain at all - there is no zero. As for FireCapture, I used it a lot and quite like it but now, prefer SharpCap - in the end they are all similar and, I think, it becomes a question of personal preference. Yesterday, I removed the mirror cell and made modifications which include locking screws so that nothing changes once set. Still waiting for the clouds to go so that trials can continue. MAJOR PROGRESS JUST MADE !! After trying numerous different approaches and soliciting advice from others, I think the problem is now almost solved - just needs fine tuning and more practice. Suspecting that image acquisition may be an issue, I upgraded my PC with USB 3 thus allowing full advantage from my ASI174MM in terms of frame rate. Almost immediately, under slightly improved viewing conditions, one could see improved image quality on the monitor and after capturing, stacking and wavelet manipulation, the images were substantially improved. Following are some images from this morning using only a 200 frame capture and 25% stacked. With larger sized capture files and reduced % stacked followed by more careful wavelets and other manipulations, I would hope to create some really good images. The whole point of building a Solar Newton scope was to capture better granulation detail which had pretty well maxed out with my TS 115mm refractor. Granule detail is now far superior to anything I'd ever captured before and, should only improve with time. With AR2462 & 2463 rounding the corner, I look forward to capturing some interesting images next week. Many thanks to all those who offered a variety of suggestions on how to solve my problem - it was an interesting exerecise in problem solving. Are you saying the major problem was the imaging acquisition?? Faster frame rate the significant change?? Yes, my conclusion is that the frame rate was the culprit on the basis of yesterday's experience - time and further captures will confirm this I hope. Otherwise, it was just a lucky break. With a "moving" target (ie: one that is flickering plus wind movement), a faster frame rate definitely made a difference. Though the DMK41 is a good imaging device, it is hampered by a maximum frame rate of 15 fps. The newer ASI174MM with USB 3 is as high as 164 fps at full resolution and, higher still with lower resolution. The improvement was instantly evident on the monitor prior to capture. This coming week will have the benefit of two new sunspots to work with and, I'm hoping for some really good images - will certainly post them as they come. One of the things that made this exercise interesting was the many and varied alternatives suggested and tried before and after my post. With each new "idea", I rushed to try it out with high expectations only to have it fail. What I needed was an "outside of the box" flash and, perchance the USB 3 upgrade seems to have provided it. Bill, I'm glad that the image is now better. Looking forward to seeing some 8-inch sunspot action. [whrudey] wrote: Though the DMK41 is a good imaging device, it is hampered by a maximum frame rate of 15 fps. The newer ASI174MM with USB 3 is as high as 164 fps at full resolution and, higher still with lower resolution. The improvement was instantly evident on the monitor prior to capture. Have you compared directly DMK41 and ASI174MM at the same conditions? I disagree that framerate itself would cause the difference in the raw images as seen on the monitor, provided the shutter times are similarly short. I'd suspect either you finally got good seeing, or the DMK41 for some other reason didn't play nice with the Newtonian (perhaps too much heat and higher sensor noise?). Many thanks to those who've shown interest in this project - I do appreciate the comments. 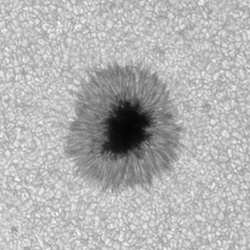 To GreatAttractor, though I've not yet compared the DMK41 with the ASI174MM (USB3) under identical conditions, I can tell you that the Solar Newton images I posted were under conditions where with my TS 115mm APO triplet/Baader/DMK41 at the same time, was unable to match images obtained earlier with better conditions. It was immediately evident to me on the monitor that the scanning was superior, which I assume to be the result of much shorter exposures and more of them in the same period. I was using a lower resolution so, the frame rate was even higher than the maximum of 163 at full resolution. It makes sense to me that a higher frame rate/shorter exposure would be beneficial with the scintillation and wind experienced at the time. Again, time will tell and, I will address this issue in due course - I was simply so thrilled to finally see nice granules that I didn't try other combinations at the time. To Neo, you're right - the images I posted were quick and dirty and, were not given careful, loving attention during post processing. In time that will happen and should result in better yet images I hope. After this saga over the past several months, I'm just delighted to be now heading in the right direction after so many past failures. To Mark, yes, post processing is an issue and be addressed in such a fashion as to keep noise to a minimum. That would result in greater detail in the granule bodies and, hopefully approach image quality of Christian Viladrich with his 10" Solar Newton and Ca-K line filter vs, my Solar Continuum. Note also, as I understand it, that Christian uses a Basler 1920 device with a frame rate of 155 fps. Solar kit: GP-C8 with Thousand Oaks Solar filter, APM 80mm F/6, Lunt Herschel Wedge, Solar Spectrum 0.3Å H-alpha filter, Beloptic Tri-Band ERF (80mm free aperture), Thousand Oaks 90mm ERF, Coronado SolarMax II 60mm with Double Stack Unit. Lunt straight B1800 Ca-K module. Merlin66 wrote: Good point Michael! Absolutely, but the combination of faster frame rate plus better QE is the killer combination. The ASI174MM allows you to select short exposures without reducing quality due to low photon count, and that ensures your exposure time does not become a bottleneck in selecting the frame rate. You can only hit the 164 FPS max rate if your exposure time is 6ms or shorter. Again, many thanks to all who offered their thoughts on my Solar Newton issues. I think that we are on the right track now with the ASI174MM given its good fps. Today's viewing conditions were poor with a persistent haze. Nonetheless, I persisted and captured a few quick and dirty images which are light years ahead of what I'd obtained previously with the slower DMK41 - I am convinced now that this is the way to go. My focus at present (please pardon the pun), is to define the granule edges and retain some detail within. Despite today's poor conditions, I believe that progress is being made. Fair as today's images are, they are still better than anything I could get with my TS 115mm APO triple under ideal conditions. With today's setup, Exposure in SharpCap was less than 2ms and resolution was set at 1280 x 1024 which, should allow maximum frame rate. On average, acquiring 300 frames took about 8 seconds which equates to about 38 fps ?? Not sure why. I look forward to some good viewing conditions to challenge the setup. So I think it's the frame rate which improves the outcome, not the QE. Notwithstanding QE parameters, frame rate, exposure, gain, coefficient of expansion, etc., I think my Solar Newton is good to go. Today, with better than average conditions, I capture a few images which I'll post on Solar Chat for all to see. Now, it's just a matter of improving my skills in using the scope and, the major trials and tribulations are over for the moment. Many thanks to all those who participated in this exercise. Any chance of a completely unprocessed version of one of the shots with the 174? Can do but, it will have to be tomorrow morning - the files are on the Observatory computer. Are you still concerned about noise ? Remember, these images were processed in a rapid manner. I assume that you want the tiff file that comes out of AutoStakkert!2 - the AVI file is 350meg plus. Tried sending the tiff files (they're quite large) via the SolarChat Website and it choked. E-mail me at whrudey@candw.ky and, I'll send them on to you directly. A couple of observations; I cropped the image down before processing as the edges of it were very unsharp as you're not using the crop function in the stacking software. There's a gradient and banding across the image, not sure why but you should be able to get rid of it easily with a flat. Some focus shift too across the image diagonally - is the camera not orthogonal to the axis maybe? Many thanks for taking the time to rework my images. I do like the improvement in grey-scale and reduced noise. You definitely teased out more fine detail in the granules. I took the liberty of reworking your reworked version and came up with the following in both monochrome and colour. I personally prefer a little more contrast and brighter image. In the end, it all comes down to personal preference. I will work now to more closely approximate your version.